Named after its shape and beauty, Tortola is the largest of the British Virgin Islands at 12 miles long and 3 miles wide. The island is volcanic in origin with a frangipani and sage covered mountainous terrain in the south and white soft beaches, banana plantations, mango groves and palm trees in the North. The BVI capital is Road Town, and it is located in the center of Tortola. The main economy here is provided through the financial industry and tourism. With its spectacular beaches, quaint cafes, numerous restaurants and protected anchorages Tortola is the starting place for all Yacht Charters in the British Virgin Islands. The holding is good and mooring buoys are available. The water colours are fabulous turquoise and blues, and offer great snorkeling and diving. 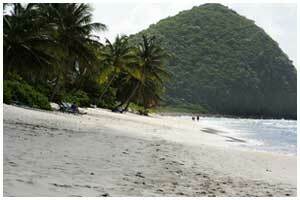 Nanny Cay is located on the southern side of Tortola, half way between Road Town and the West End. The entrance to the cay is straight off Sir Francis Drakes Channel giving it a great position to get to all of the surrounding islands. The Cay is tucked between two picturesque mountains and on the low-lying piece of land you will find Nanny Cay Marina, the largest marina in the BVIs and they offer a full range of excellent facilities. There are two restaurants, gift shops, a small grocery shops and if you need fuel, water and ice they are available here. 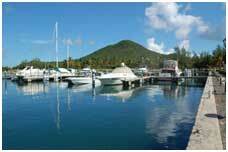 Road Harbour is a beautiful, spacious harbor that encases Road Town and is the largest anchorage in the BVI. The harbor is located centrally on the southern coast and is a busy harbor used by ferry companies, cruise ships, charterers and fisherman. The channel is clearly marked and will take you past Lark and Scotch Bank, Harbour Rock and Baughers Bay and into the Inner Harbour where you will find plenty of space to anchor. There are two large jetties that separate Wickham’s Cay on the left and Wickham’s Cay II on the right. There are plenty of places for you to leave your dinghy while you go into the town and explore. Brandywine Bay is located on the southeastern side of the island. It has a perfect white powdery beach that due to erosion has been replenished from sand around the island. The bay entrance is wide but good light is needed to enter as there are reefs that extend from either side of the bay. Mooring buoys have been placed in the center of the bay by Brandywine Bay Restaurant and are available to charterers if they dine at the restaurant. If you anchor stay in the middle of the bay in depths of around 10 feet as towards the shore it gets shallow quickly. The bottom is sand with a few patches of turtle grass nearer the shore. This anchorage is usually quiet and the scenery is spectacular with lush green hillside full of trees towering in the background. A perfect setting to relax on your yacht while you sip a cold drink and eat fresh fish grilled on your BBQ. Maya Cove also known as Hodges Creek is situated behind Buck Island and is a picturesque cove with a few small marinas, restaurants, bars and Fat Hog Bob’s Restaurant tucked into the western corner. The anchorage is well protected by Buck Island and the reef, making it a perfect place to relax, swim and enjoy the views of Sir Francis Drake Channel. Fat Hog’s Bay is the largest bay in the Eastern side of Tortola and the land around the bay has the second largest residential community of the island. The bay is a great over night stop, with beauty and shelter it offers marinas, restaurants and shops. The bay has stands of mangroves that attract many varieties of heron including the Great Blue Heron, Green-backed Herons and Yellow-crowned Night herons. Cane Garden Bay is a large bay located on the Western side of the island. This exquisite horseshoe shaped bay has a pristine beach, well marked spacious anchorage and stunning mountainous views. Make sure you dive on your anchor to check it is well set as the wind does shift as it tumbles down the mountains. Snorkelers will love the reef on the western end of the bay, with clear waters the visibility is good and there is an abundance of marine life for you to swim with. Do not be fooled by the bays beautiful appearance of tranquility and peace, this is a lively part of Tortola. The dinghy dock is integrated into the rocks and once you are ashore you will feel the buzz of this little village. Restaurants and bars are scattered from the waters edge and weave there way into the mountainous hillside. Dance the night away as you listen to the reggae band and feast on the great food served at the many restaurants in this area. Soper Hole is a well protected anchorage on the Western tip of Tortola, tucked between the main island and Frenchman’s Cay. In 1648 the first Dutch settlers landed here and the bay was well known for being a pirates den. Today the anchorage is one of the three main ports of entry as it is very deep and a good place for larger vessels to anchor. There are plenty of mooring balls available for a fee and if you prefer to anchor, tuck your yacht up into the North East corner of the bay as it is shallower here. There is no anchoring on the west side of the bay and therefore it is a great place to swim and snorkel. Go ashore and be dazzled by the candy coloured shops, houses, restaurant and bars. The people here are very friendly and the charming West Indian style Sopers Wharf and Marina is a great place to purchase gifts and clothing. Beef Island is located east of Tortola and is joined by the Queen Elizabeth Bridge. The island has the Terrance B Lettsome International Airport located here and it services all of the BVI. The island is mainly bush covered mountains with houses, restaurants, and a few small resorts scattered into the hillside and along the beach front. You will find many local art studios where you can purchase paintings, pottery, metal sculptures and other gifts to take back home. If you are in the area on a full moon there is a spectacular festival at Trellis Bay. Trellis Bay is a popular anchorage near the airport. For yachts with masts over 50feet you will need to contact the Air Traffic Control Center on VFH Channel 10 or 16 to let them know you will be entering the bay. The channel into the anchorage is marked with green and red buoys and the Yellow buoys mark a restricted area around the flight runway path. There are plenty of mooring buoys in the bay and it is advisable to pick one up. If you arrive late and all the moorings are taken you can anchor in the northeast corner towards Sprat Point, the water does get shallow quickly so take care. You can also anchor in the southwest corner near Fluke’s, just be careful when passing by Bellamy Cay as a reef runs into the bay in a southerly direction. There are plenty of places to leave your dinghy when you go and visit this fun and friendly village. You will find a small market, bars, restaurants, an Internet Café and the art studio of Aragorn. If you are looking for cocktails and the best Conch Fritters in the Caribbean then you want to visit De Loose Mongoose. A great evening’s entertainment can be found at The Last Resort, on Bellamy Cay. The owners prepare a great meal and the evening is full of jokes, music and fun entertainment. Sailing five miles south from Tortola, across the beautiful Sir Francis Drake Channel you will reach the tiny, unspoiled Cooper Island. The island is approximately one and a half miles by half a mile and is a stunning treasure offering a golden sandy beach, excellent snorkeling, lush tropical vegetation and the most amazing sunset views. The island is covered in coconut palms, lime trees, frangipani, hibiscus, cactus, orchids and other exotic plants. Full of natural beauty, the island has no roads, one beach club and a few private residential properties on it. Relax and enjoy the friendly atmosphere as you sip a cold cocktail under a palm tree or dine in the beach front open air restaurant at The Beach Club. Manchioneel Bay is the main anchorage of the island and has around 40 mooring buoys that are run by The Beach Club. The holding here is not very good as the bottom is sea grass and boats have been known to drag, it is strongly suggested that you arrive at the anchorage early and pick up a buoy. Charterers can take their dinghy to Cistern Point where there are dinghy mooring buoys. 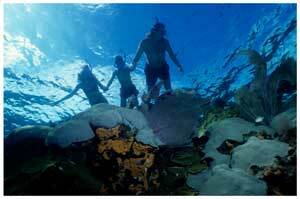 The snorkeling here is excellent and you will see a wide variety of tropical, colourful sea life. 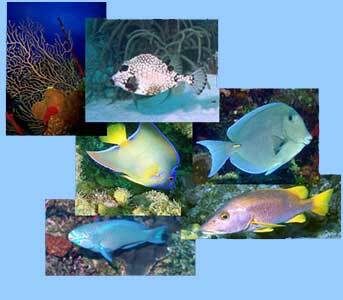 Queen angelfish, jacks, sergeant majors, grey snapper, blue tang and goatfish all inhabit the waters here. Snorkeling around your yacht can also be fun, look closely into the sea grass as you will find green turtles, sting and eagle rays and a large Queen Conch bed. The beach here is of beautiful golden sand and it is studded with Manchineel Trees and palm trees. (Manchineel Trees are very poisonous; do not touch the tree or the small apple fruit growing on it). Carvel Bay and Haulover Bay are also located on the western side of the island; they are used as a day time anchorage and should only be used in light winds. An island of rare beauty and history, Salt Island is located about 4.7 miles south east of Road Town. There are two salt ponds on the island and during the harvest season the island would have been full of festivities and music. People would travel a long way to collect salt and help with the harvest. At one time over 100 Salt Islanders lived here and where supported by a thriving salt industry, unfortunately the island has been uninhabited since 2004. The main attraction to the island today is the R.M.S. Rhone, shipwrecked in 1867. The R.M.S. Rhone, was a Royal Mail Steam packet ship, 310 feet in length, 40 feet wide and had over 300 passenger cabins. Commissioned in 1865 she has a unique design that allowed both sail and steam power. During a hurricane on the 29thOctober 1867 the Captain, Robert Wolley, was washed overboard and with the helm unmanned the ship hit Black Rock Point. As the cold water rushed in and engulfed the hot boiler, it exploded and split the magnificent ship into two. Only 23 people survived and 124 passengers and crew lost their lives. The ship now rests on the sea bed in two locations, one at 30feet and the other at 90feet. The R.M.S. 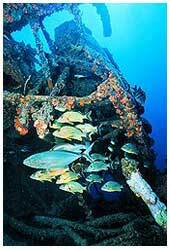 Rhone wreck is known for being the best dive site in the Caribbean. The area around the Rhone is a National Park and therefore anchoring is prohibited. The Trust has provided mooring buoys that you can pick up or you can anchor in Lee Bay or Salt Island Bay. These anchorages are only recommended as day stops as they are not protected and can get very rough. This “Little Sister” offers spectacular panoramic views of the Caribbean Sea and Sir Francis Drake Channel. The privately owned island is uninhabited and has a magnificent turquoise heart shaped bay on the southern side. Ginger Island is known for its popular dive sites that include “Alice in Wonderland”, “Alice’s Back Door” and “Ginger Steps”. The incredible reefs, pillar corals, brain corals and variety of sea life make this a magical place. With a great display of eagle rays, octopus, turtles, lobsters and morays these warm, clear waters will have you captivated. There are two mooring buoys located in South Bay but they are usually taken by commercial dive boats. Anchoring here is fine but should be used as a day anchorage only, a great stop to have lunch and snorkel. "Fifteen men on the dead man's chest… Yo-ho-ho, and a bottle of rum!" Peter Island is privately owned by JVA Enterprises and was named after Pieter Adriensen in the early 17th Century. This luxurious stylish boomerang shaped island has won many awards and has recently been listed on the 2007 Condé Nast Traveler“Gold List”. With 1800 acres of lush tropical mountains, 6 breathtakingly beautiful bays, 20 secluded coves and 5 pristine white powdery beaches this is the fifth largest island in the BVI. The island has a small marina, resort, restaurant and bar and if you are feeling energetic take a walk over the lush mountain tops. Charterers will find superb anchorages offered around Peter Island and the beaches are a great place to relax under the shade of the palm trees. Deadman’s Bay is named after the 15 unlucky souls of Blackbeard’s pirate ship that were washed ashore after being marooned on Dead Chest Island. Deadman’s Bay has a spectacular mile long crescent shaped shoreline with soft white powdery sand studded with towering coconut palms and sea grape trees. You will see a restricted area that is reserved for resort guests only; however, charterers may anchor on the south east end of the bay just off Little Deadman’s Bay. The anchorage is only recommended as a day stop as the bottom is sea grass and holding is poor. There is good snorkeling in this area, so jump off your yacht and splash into the cool clear water where you will find turtles hiding amongst the grass. On the beach Deadman’s Bar and Grill offers lunch and dinner, with a wood-fired pizza oven, buffet and hot entrees it is a great place to enjoy the continental flavors of the Caribbean. If you prefer to relax on your yacht, have a BBQ and cocktails as you listen to the rhythmic beats of the live steel band that entertain in the beach bar. Sprat Bay is the main water entrance for the island and resort. The bay has a 20 berth marina, mooring buoys, shower facilities, ice, water, fuel and the elegant Tradewinds restaurant. Great Harbour is located on the northern central coast. The anchorage is large and has a few mooring buoys at both the innermost eastern end and western corner of the bay. The holding here is not brilliant, you may need to anchor a few times before your anchor digs. There are small beaches along the shore and snorkeling is good around Buttonwood Bay on the Western end of Great Harbour. The coral reef is located about 60 feet offshore and depths start at 8 feet sloping gently to around 20 feet and then dropping vertically. The protected water is incredibly clear and there is an abundance of small colourful fish. When snorkeling or swimming be very careful of passing boats and fisherman. Just outside the entrance lies the R.M.S. Rhone’s anchor, separated from the main ship it is still a popular dive site. Dinghy over to Callaloo Bar and Restaurant on Buttonwood Bay Beach and enjoy a leisurely lunch. Little Harbour is a picturesque and tranquil anchorage on the western side of the island and is a perfect overnight stop. The small bay boasts crystal clear waters, a vibrant coral reef and a protected small white sandy beach. White Bay on the southern side of the island is named after its beautiful long stretch of glistening white soft sand. With no restaurants or bars the large deserted bay offers charterers peace and quiet where you can snorkel the reefs, enjoy a BBQ or just lie on your yacht and bask in the glorious sunshine. 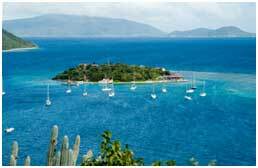 Norman Island is one of the most southerly islands of the picturesque BVI archipelago. 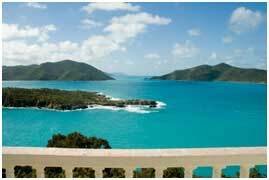 It sits close to the international boundary that separates the BVI and the USVI. The island has 610 acres of amazing land formation that offers rolling hillside that gently descends from the ridge that runs the length of the island, down to the waves that rhythmically caress the white sandy beach and rocks. The coast line is a sailor’s dream, with numerous bays, secluded snorkeling spots and The Bight is one of the largest protected anchorages in the BVI. The island is uninhabited and was once used for grazing cattle. 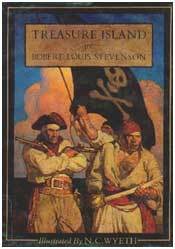 The history of the island is filled with Pirates and treasure caves, and is said to be the inspiration for “Treasure Island”, the adventure novel by Scottish author Robert Louis Stevenson, narrating a tale of "buccaneers and buried gold". The Bight offers a popular, well sheltered anchorage on the north western side of the island. 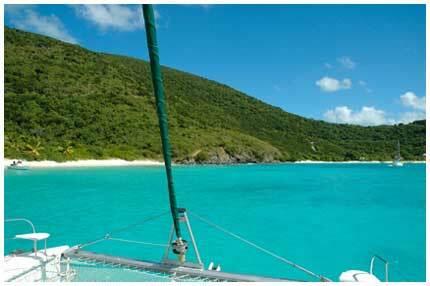 The bay is the largest protected anchorage in the BVI and the entrance is between Water Point and Treasure point. Just south of Water Point is Kelly’s Cove, this small bay offers only a few yachts a secluded private anchorage that is away from the hustle and bustle of the main anchorage. There are two bars and restaurant facilities in the Bay. The first is William Thornton’s Floating Bar and restaurant. You will need to tie your dinghy up to the boat and climb aboard. You will find the boat very lively, full of fun and entertainment as well as a good menu. Pirates Bight Bar and Restaurant is located on the beach and has a dinghy dock that you can tie up to. There are two happy hours a day and often you they will have a live band playing. Gifts and souvenirs are also available in the small gift shop. At the southern end of the beach you will find a great place to snorkel. The reef extends several hundred yards and has large brain corals, sea fans, sponges and is abundant with fish and marine life. The Indians are a spectacular rock formation of four pinnacles that rise and descend from the water approximately 50 feet in both directions. They are located just off Pelican Island and can be recognized by the Indian headdress shape they make. The area is a National Park and mooring buoys have been placed for you to pick up. The site has amazing coloured coral such as star, brain and elkhorn with sea fans swaying gently and an abundance of tropical fish. There is a tunnel for divers and a large “fish bowl” where snorkelers can float over the area and observe the trunkfish, parrotfish, schoolmasters, bait fish, black durgons and many more. 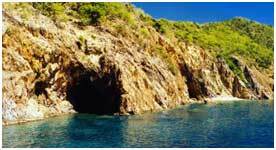 Norman Island Caves are located at Treasure point and the continued legend of buried treasure brings many snorkelers here. There is a dinghy line that you can tie up to or the National park also supplies day moorings for your yacht. The caves entrance is around 40 feet and as you venture into the caves you will find depths become shallow. The fabulous rock formations are great to explore, and are home to a wide variety of brightly coloured tropical fish, red coral and sponges. Sergeant majors, blue tangs and yellow tails will accompany you into the cave and if you hold some bread in your hand be prepared for the feeding frenzy as the fish dart around enjoying the treat. The caves shimmer as they reflect the light and if you take an underwater flashlight you will be amazed by the glistening walls of gorgeous deep purples and reds. There are two other anchorages on the northern side of the island, Soldier Bay and Benures Bay. These bays are great anchorages if the weather is calm and winds are from the south. In Benures Bay you can anchor just off the pebble beach on the north eastern side, you will anchor in about 20 feet of water and you will find good snorkeling on the western end of the bay. The Baths on the south west coast of Virgin Gorda are a unique natural phenomenon and clearly show the islands volcanic origin. The huge granite boulders, some as large as 40 feet, lie in piles on the soft white powdery beach that is studded with coconut and sea grape palms. 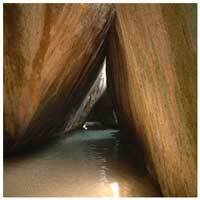 The numerous boulders form mysterious grottoes with sandy bottom pools that open out to the sea. When entering the grottoes you will see the amazing colours of these natural stones as light reflects off them and exploring and snorkeling around the outside perimeter is a great way to spend a relaxing afternoon. The area was declared a National Park in 1990 and mooring buoys are available if you wish to visit. Always look for the coloured flags as they will tell you what the sea conditions are. Moorings not available due to rough sea conditions. Mooring balls to be used with extreme caution. Do not leave boat unattended. Moorings are available for use. Jellyfish are present in the water. Virgin Gorda Yacht Harbour is located on the south west coast of Virgin Gorda and is surrounded by Spanish Town and The Valley. The modern marina complex was built by the Little Dix Bay Corporation and offers 111 slips, ships store, and shopping centre with over a dozen shops, restaurants, bars, bank, Laundromat, drug store and dive shop. If you would like to anchor you can do so on the port side of the bay. Little Dix Bay is a crescent shaped bay that is protected by its own reef that spreads across the bay entrance. The idyllically tranquil and elegant setting is home to Rockefeller’s luxury hotel that is nestled between two small picturesque mountains and has a beautiful curved beach that outlines the cove. Guests are welcome to use the facilities, eat in the restaurant and relax in the bar, this is an exclusive resort so be prepared to pay for the privilege. Savannah Bay and Pond Bay are sheltered by the reef and this gives protection from the northern swell. The beautiful mile long curved stretch of white sand is quite secluded and it is a great place to watch the sun go down or take a romantic stroll at night as the moon’s reflection glistens in the water. The waters are a fabulous turquoise colour and great for snorkeling and swimming. 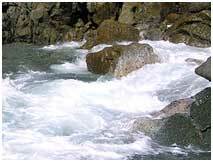 When entering the water take care as the current can be strong here. Mahoe Bay is on the western coastline and is a secluded bay with vivid blue water. You will need to have a shallow draft and anchor in good light to avoid the reef. Mahoe Bay forms a tropical lagoon and the snorkeling here is especially good with a vast variety of sea life and many hawksbill sea turtles. There is a restaurant on the far western side of the bay that offers good meals and a bar. Leverick bay is located on the West side of North Sound and has a small 20 slip marina and around 36 mooring balls. The marina offers good facilities with swimming pool, showering block, water, ice, diesel, and a restaurant. You will also be able to use Wifi and there are a few shops in the area for extra provisioning. You will find a shipwreck located just off the shore that is a great place to snorkel. Biras Creek has three separate bays that make up the Biras Creek Resort, Biras Creek at the western side of the island is a well protected bay lined with mangroves and has marina facilities. Berchers bay on the southern side of the island has a rugged beach and rocky hills that plunge into the sea, not recommended for anchoring as there is no protection and it is open to ocean swell and waves. Deep Bay, at the northern eastern side is a picturesque paradise, with a romantically relaxing anchorage and a small private white powder beach. This perfect location offers fabulous view of the mountainous lush green scenery. The resort is open to non-residents and booking is recommended, the restaurant does have a dress code and men will be required to ware long trousers. Bitter End is located on the Eastern side of the North Sound. This fabulously exotic yacht club has a unique ambiance, and houses the largest water sport fleet in the world. The area can only be reached by water and offers a 70 slip marina, mooring balls if you wish to pick one up or ample room for anchoring. They offer showers, garbage collection, several restaurants and nightly entertainment. Yacht Charterers and sailors love this picturesque setting with calm protected waters. 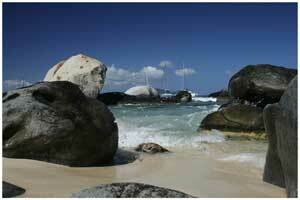 There are many smaller bays around North Sound on the coast of Virgin Gorda. You will find pretty little anchorages that boast fantastic views of the mountainous backdrop and clear warm turquoise waters. Blunder Bay, Gun Creek, Robins Bay and Little bay are to name just a few. You will find great delight in sailing the North Sound as there is always a peaceful picturesque hideaway or if you prefer the hustle and bustle you can dine out and be fully entertained in one of the many bars and restaurants. Saba Rock is a very small island in-between Prickly Pear Island and Bitter End. The island offers a friendly atmosphere that welcomes all charterers, there is a free WIFI service and you will receive ice and water if you stay on the dock or on a mooring buoy overnight. This pretty little island offers accommodations, a good restaurant and a lively bar. Prickly Pear Island is on the north eastern side of North Sound and is shaped remarkably like a wellington boot. The island is a 243 acre National Park and is covered in lush tropical green vegetation and cacti. The island is unspoiled and has a beautiful hiking trail, salt ponds and stunning beaches surrounding the island. There are several mooring buoys at Vixen point and if you prefer to anchor the holding is good on a sandy bottom. The point has a beautiful white sandy beach and the Sand Box restaurant and bar serve great home made meals and delicious frozen cocktails. Vixen point is a lovely place to swim, snorkel, sunbathe and totally relax. Mosquito Island is a charming small island at the entrance of North Sound. Drake’s anchorage has excellent holding and is well protected by Colquhoun reef and the island itself. You will find depths of around 25 feet in the anchorage or mooring buoys are available if you wish to pick one up. The island is a great place to relax on the golden beach or take a hike along the old trail that is now overgrown and hardly visible. You will find it your own little paradise as the island is often overlooked by sailors. 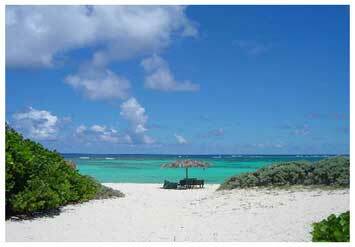 Anegada is the northernmost island of the British Virgin Islands and is the second largest island. This spectacular island gem is located 15 miles north of Virgin Gorda and has an area of around 15 square miles with the highest point being only 28 feet above sea level. The island is different to the other British Virgin Islands as it is very flat and rather than volcanic it is formed from Coral and limestone. The population on the island is very small and most of the islanders live in The Settlement or often is referred to as the Village. The islands north coast is edged by one long beautiful white sandy beach that stretches for miles and is a fabulous place if you are looking to relax and take a leisurely stroll. If you are a keen snorkeler or diver then the reefs that surround the entire island will be your new playground. 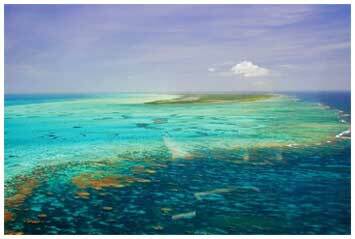 The vast 18 mile coral barrier reef system is the third largest in the world and the largest in the Caribbean. Horseshoe Reef begins at the western tip of Anegada and follows the northern shore in a semi circle until it reaches the southeastern point, it then continues south towards Virgin Gorda. Claiming over 300 ships the reef is very hazardous and great care is needed when sailing these waters. Auguste George airport is the islands small airport, and the island has a few restaurants, bars and a sanctuary for flamingos and ospreys. Don’t be surprised if you find cattle and donkeys wandering aimlessly as they are free to roam around the island. The main trades of Anegada are tourism and fishing, the islands fishermen provide most of the fish and lobster for the British Virgin Islands and if you like flyfishing you will definitely love Anegada. Anegada Harbour is located between Pomato Point and Setting Point. The channel is through a cut in the reef and there are large markers to guide you in. The anchorage is well protected and offers 10 mooring buoys that can be paid for at the Anegada Reef Hotel. If there are no mooring buoys available you can anchor in the bay, the bottom is sand and the holding is good with depths of around 8 feet. This tricky entrance has numerous scattered coral heads and so the best time to arrive is around midday, when the light is good. Consult your charts and get local knowledge of this area before you enter. NOTE: Some Charter companies request that you take a skipper if you wish to visit Anegada, please check the company policy before leaving the base. This group of uninhabited islands lies on the North West coast of Virgin Gorda and East of Great Camanoe. The islands are now protected by the BVI National Park Trust and are named after the Caribbean Monk Seal that was hunted to extinction in the mid 1950s. The islands have a very rugged volcanic terrain rising dramatically out of the sea and fabulous surrounding reefs that are known for superior snorkeling and diving. The waters are filled with tropical fish, brightly coloured reefs, pinnacles, caves, tunnels and canyons. While on land the abundance of bird species use the islands to find protection and safe breeding ground. Some mooring buoys have been provided by the national park and there are a few good daytime anchorages. The best anchorage is in the bay to the west of Kitchen point on George Dog and moorings are available in approximately 25 feet of water. On Great Dog you will have two choices. The first and most popular is on the south side of the island and there is a second off the beach on the northwest coast. This anchorage is great for snorkeling but not advisable to use in rough weather conditions. 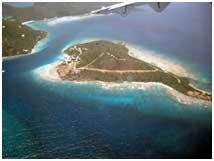 This 230 acre island is located east of Marina Cay and is privately owned. Scrub is a beautiful island with rich natural beauty, blue clear waters, white sand beaches and lush tropical foliage. The island is being developed and by spring 2008 a luxury resort and spa will be opening along with a new marina with 67 fixed slips. The islands will have new private villa and apartment dwellings. At the moment Donovan’s Reef restaurant is the only eating establishment on the island and is a great place to have lunch or an evening meal. The service is excellent, food is superb and spending an evening there is relaxing and you can watch the waves gently caress the beach. Marina Cay is owned by Charles Tobias, owner of Pusser's . The Cay was originally owned by Robb and Rodie White who had a dream to develop the island into a resort. Unfortunately the Second World War took Robb away from the island and on his return they were forced to leave. All that remains of their dream is their original home on the hillside that is now used as a library and peaceful reading lounge with great views. Robb White wrote the book “Two on the Isle”, a classic about life with his bride on Marina Cay in the 1940s. The island is an eight acres tropical garden with exotic flowers, lovely emerald green walkways and a unique cultural history all of its own. The island has small soft white sandy beaches and is surrounded by a shallow lagoon with calm clear waters and a coral reef that offers snorkelers an underwater view of brightly coloured fish and marine life. The resort boasts an award winning restaurant with a varied menu and plenty to choose from. There is also a nightly BBQ where you can sit and enjoy the beach views and watch your yacht swaying gently at anchor. The Bar located at The White’s house on the hill top is a great place for charterers to meet and the atmosphere is always lively with live music most evening. Don’t miss cocktail hour where you can drink the famous Pusser’s Painkiller. The cocktail is a blend of pineapple, OJ, coconut crème and shots of Pusser’s navy dark rum. Marina Cay welcomes yacht charterers and has installed many mooring buoys that you can pick up. The island is protected on three sides by reefs so you can only approach the anchorage from the West. Always enter with good light and keep a watch for coral heads. There is a red marker buoy that marks the western corner of the reef so stay clear and curl up into the anchorage. There are 12 mooring buoys and these can be paid for at the resort. If you are going to anchor you will find the bottom is sand and has good holding with depths around 15-20 feet. When anchoring stay clear of the dock as the ferries run regularly and need a clear pathway. The resort has installed a high resolution camera on the fuel dock that takes a picture every 15 seconds. 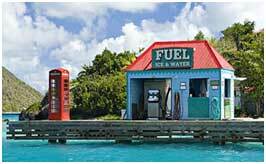 Stand along side the antique British phone box, look towards the fuel hut and smile! You will then find your picture on the Pusser’s web page under the Red Box section. The phone box actually works, so if you are looking to make a call home to tell everyone what a great time you are having, now is your chance. A small island measuring 2.5 miles by 0.5 miles and located just north of Beef Island, Great Camanoe is primarily residential. On this peaceful island you will find exotic flowers growing wildly, sweet smelling orchids, pleasant paths to take a walk along and the most amazing views of the nearby islands. The salt ponds offer bird lovers a fabulous display of migratory wading birds. Sunbathe on your yacht and feel the warm tropical breeze blowing through your hair or dive into the cool refreshing sea and swim with the teeming reef life that inhabit this National Marine Park. The shell covered beaches are a great place to relax, have a picnic or simply lie and catch a suntan. As the sun goes down and the night darkens watch the island lights twinkle like diamonds and you will then see the magic of this small island. There are two main anchorages around this beautiful island. The first is the National Park at Cam Bay on the eastern shore. The entrance can be a little tricky with a reef stretching across its mouth and you will find the opening on the left side of the reef. There are a few mooring buoys or you can anchor anywhere in the bay with depths around 10 to 15 feet. The bay has an amazing shallow reef that is abundant with marine life and great to snorkel. Swimming in these clear, warm, calm waters will make you feel like you are in a luxury swimming pool. Lee bay on the Western shore is a pleasant little anchorage. You will find depths of around 20 feet and the waters here are very clear. Once again there is a reef so care is needed when entering the anchorage. You will see the magnificent rocks rising from the water and hear the sound of the waves hitting the rock hollows, the setting is unspoiled and perfect for relaxing, having a drink and a tasty BBQ. 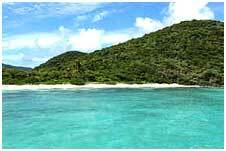 Guana Island is an 850 acre wildlife sanctuary and is the sixth largest island in the BVI. It is now privately owned. In the 18th Century the island was used by Quakers to harvest vegetables and grow cotton. Today it is a luxury resort with undisturbed natural beauty that has been restored and now protected by biologists, botanists and scientists. The island is a true tropical paradise with lush mountainous green forests, rock formations that plunge into the sea and fabulous fauna and flora. The islands wildlife includes Caribbean Flamingos, iguanas, land turtles, frogs, snakes and over 50 amazing bird species that nest in the rocky coasts and cliffs. The island is home to many endangered or threatened species such as the roseate tern, bridled quail dove and the Newton’s barefoot screech owl that was once believed to be extinct. The island has an orchard and a large salt pond that is home to wading birds. The resort area is reserved for guests only so please respect their privacy. Monkey Point anchorage is located on the southern tip of Guana Island and is known for its fantastic snorkeling and diving. There are mooring buoys provided by the National Park Trust that you must pick up. There is a small beach that you can dinghy onto and enjoy a picnic or just relax on your yacht and have a leisurely lunch before moving to White Bay for your overnight anchorage. 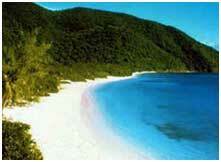 White Bay is located on the western shore and as its name suggests it has a magnificent long white sandy beach. There are shallow coral reef patches running alongside the beach so great care is needed when anchoring. Mooring buoys have also been provided for charterers to pick up. The variety of fish in this preserved area is astonishing, so if you love snorkeling Guana Island is definitely worth the stop. Muskmelon Bay is on the north western side of the island and the bay is deep with a sandy bottom. The bay offers flat waters and excellent diving and snorkeling where you will see plenty of fish and even large tarpons and tuna venture into shallower parts of the bay. On the northwest corner of the bay you will find a platform which has steps leading up the hill and then the trail follows the coast to Crab Cove. This is a lovely walk especially in the evening when the bays position gives you a full view of a perfect Caribbean sunset. Located on the North West side of Tortola, Jost Van Dyke is the smallest of the four main islands in the BVI and measures 3.9 miles by 1.4miles. The island is named after a Dutch pirate that used the island as a hide away. Today the island is a sailors dream with its large anchorages, three perfect white sandy beaches and its volcanic mountainous terrain. The island offers charterers a real insight into the Caribbean way of life with its laid back atmosphere, friendly people, chilled out beach bars and sandy main street. The island is surrounded by turquoise waters, smaller cays that offer fantastic snorkeling and swimming and if you are feeling energetic you can take a hike inland amongst the lush tropical vegetation. Lobster is the islands specialty dish and most restaurants offer it with a variety of Caribbean spices and authentic flavours. The main town is located at Great Harbour where most of the islands business takes place and is a classic West Indian Village. The main road is a sandy beach where you will find plenty of restaurants, bars and souvenir shops. If you walk up the Alley you will find the ice house on Bun road, where you can purchase crushed and cubed ice. A great place for breakfast is Christine’s Bakery where you can order all home made freshly baked breads, cakes and hot breakfasts. If you need to stock up on fruits and vegetables you will find Nature’s Basket a little way from the ice house, the shop owner has his own plantations where he grows papayas, bananas, pineapples and mangoes. No stop is complete without a visit to see Foxy Callwood. Foxy Callwood is a cheerful Caribbean character and his restaurant and bar is talked about by all sailors around the world. There is never a dull moment as Foxy is a born entertainer, he has many stories to tell about the world he has traveled, he is a great sailor and fisherman and will be happy to sing you a song. There is no doubt that Foxy is a legend and he is a strong part of the community organizing Regattas, New Years Eve Parties and Halloween Parties. At New Year the island looses its peace and tranquility and becomes a hive of activity with over 300 yachts attending the party that has live music from dusk till dawn. The restaurant serves good food and on Friday and Saturday evenings they have a big BBQ. Be prepared to smile, have great fun, play games and have plenty to drink! If you like hiking then you can climb to the top of Roach Hill which is the tallest point of the island standing at around 1054 feet above sea level. Once you reach the top you will have the most stunning 360° views of the British Virgin Islands. In the Autumn and Winter you can observe whales and dolphins from these tropical hilltops. Another trail to take a stroll along is from Great Harbour over the hill to the peaceful and beautiful White Bay. On a clear day you can see all the way to St Thomas and if you decide to walk in the evening your path will be illuminated by the glowing moon and the brightly studded star filled sky. The island has several good anchorages and small marinas. The waters are clear and there is an abundance of marine life amongst the numerous reefs and coral patches around the island and the small cays surrounding Jost Van Dyke are some of the prettiest in the Caribbean. Sailing these waters will give you a sense of tranquility and a calm pace of life. Great Harbour is the main port of the island and can be found in the center of the southern coast. The bay offers a well sheltered, large anchorage that is surrounded by steep lush green hillside. The harbour is outlined by a sandy beach with palm trees and hammocks ready for you to gently swing in while you sip your pina colada. Open air bars and restaurants line the main sandy street around the waters edge and to the north eastern corner you will find the famous Foxy Callwood. Care is needed when entering the anchorage as there are numerous shoals and the reef extends 300 yards from the beach. Mooring buoys have been provided and should be used if available as the holding here is poor due to the bottom being coral rock covered by only a thin layer of sand. There are two dinghy docks available, the first is through a dredged channel to the customs dock and the second is Foxy’s dock, both are available for all charterers. White Bay is a quieter anchorage on the western side of Great Harbour. The bay is named after the fabulous white fine powdery beach that is encased by warm turquoise waters. There are two narrow entrances through the reef into the anchorage and both are marked with buoys. Once inside care is needed as there are a few scattered coral heads. This bay offers 10 mooring buoys that can be paid for at either Ivan's Bar on the eastern side or the Soggy Dollar on the western side of the bay. The holding in the anchorage is good with a sandy bottom and you will find the depths around 10 to 15 feet. The water is so clear that you will be able to see your anchor dig from on deck. Ivan’s No Stress Bar can be found on the eastern beach, it has a great relaxed atmosphere and an honor payment system where you pour your own drinks and leave the payment in a jar on the bar. You will also find on Thursdays they have a BBQ and live music. On the western beach you will find the Soggy Dollar Bar, there is no dinghy dock so sailors tend to swim to the bar from their boats and buy drinks with wet bank notes, this is how the bar got it’s name. The painkiller rum cocktail originated from this bar in the 1970s and today it is usually accompanied by a flying fish sandwich. The bar gets very busy and most people will stay for hours chatting and playing games. 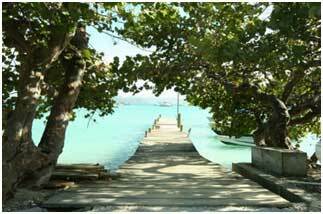 Little Harbour is on the south eastern side of Jost Van Dyke and is sometimes known as Garner Bay. The anchorage is large and very well protected with a scenic backdrop and amazingly blue water. There are 10 mooring buoys available or you can anchor anywhere in the large bay. Little Harbour Marina is very small but has fuel, water, ice, cold drinks and a full laundry service. There are three restaurants all offering charterers a good variety of food and drinks. Once again you will find that the lobster is freshly caught and cooked to perfection, all restaurants offer a real lobster feast. If you prefer a pig roast then you will want to visit Sidney’s Peace and Love restaurant on a Monday and Saturday where you can enjoy a great meal and live music. 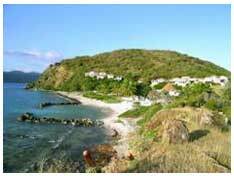 Long Bay Beach is located North of Diamond Cay on Jost Van Dyke and is being developed into a marina village. At the moment it has a small marina, perfect protected little anchorage and Foxy's Taboo Restaurant and Bar. The restaurant serves light snacks, full course meals and has a small bar. This tiny volcanic cay is located just off the eastern shore of Jost Van Dyke and in 1991 it was declared a national park. The main attraction today is the “Bubbly Pool” that is created by a natural break wall that pushes water through the gaps in the rocks to form a giant Jacuzzi. You can relax here and enjoy the foaming sea while you let all your worries drift away. The island is part of the Diamond Cay National Park and is located on the North Eastern side of Jost Van Dyke. The park is a nesting ground for wild birds such as pelicans, boobies, terns and magnificent frigate birds. The island was once home to John C Lettsome the founder of the London Medical Society. The island is a great place to anchor off and with numerous coral heads you can always find a quiet spot to snorkel. These two uninhabited islands lie to the east of Little Jost Van Dyke. Green Cay is approximately 15 acres and rises to about 100 feet above sea level. Its north and east shores have a rocky coastline while the south and west have a sandy beach. The interior is a rugged terrain with heavy vegetation and mature trees. The island slops down towards Sandy Spit and the two are connected by a 200 yard shallow coral shoal. If you are a beach lover you will adore this perfect picture postcard island. Sandy Spit is surrounded by pure white sand and has a few coconut trees in the center. The superb coral reefs surrounding these islands are excellent for snorkeling and you will see an abundance of brightly coloured marine life including angelfishes, jacks, snappers, tarpon, and schools of barracuda. With clear turquoise waters and sandy bottom these islands make an excellent location to stop and have some lunch. The anchorage often gets swell so it is not recommended for an overnight stop. 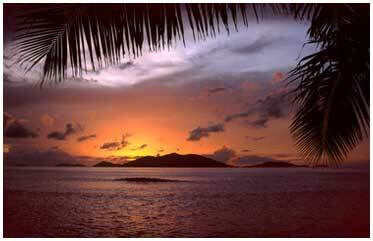 Sandy Cay is a small 14 acre island located to the south east of Jost Van Dyke. The island was donated to the National Park Trust by Laurence Rockerfeller so that its natural beauty could be preserved. This uninhabited cay is a really jewel with the most spectacular white fine powdery beaches covering three sides and water that is so clear you can see approximately 30 feet down. Its interior is filled with coconut palms, sea grapes, palm trees and has a small pond. There are many reptiles, birds and insects that live on the island and it has over 90 varieties of plants and trees. There is a small trail that you can walk along and once you reach the top of the cliff you can enjoy the great views and the sheer beauty of this magnificent island.